MW Video Systems are delighted to announce the launch of their brand new product, the height adjustable edit desk. After listening to, then acting upon feedback from customers, MW Video have created the new desk, to join the standard range of edit desks. With the aim being to help create healthy working practices for media studio users, the electrically-operated desk can be raised to allow standing at the workstation, then at a touch of a button, lowered for the seated position. 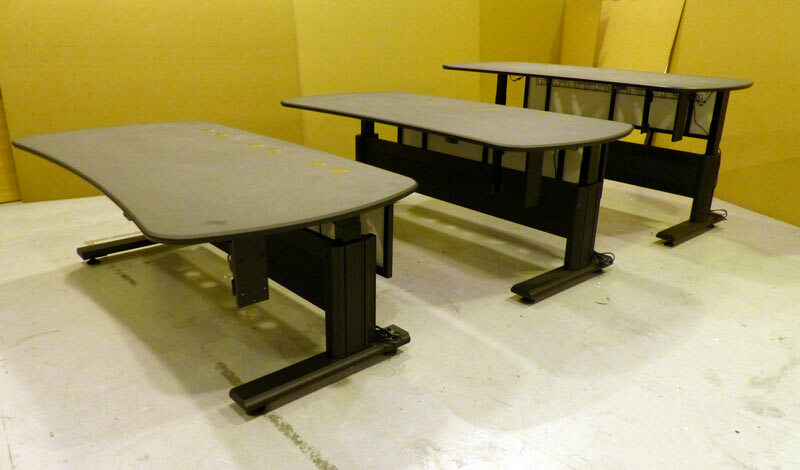 The new product line comes as MW Video were recently awarded the contract to supply 3 height adjustable edit desks for the audio department of a gaming company. The 3 edit desks will each be situated within their own studio with specialised AV equipment. Surround sound speakers and mixers, as well as supplied Novus monitors arms are provided to house 2 display screens per desk. To maintain tidy cable management whenever new equipment is added, 4 cable entries have been spaced evenly across the desks surface and a cable basket is located between the front and rear courtesy panels. As with all standard edit desks, power supplies with 6 or 8 output mains distribution unit in either 13amp or IEC are installed within the cable basket. In additon, a trunking strip is located on the side of one of the actuated legs, to allow the cable to be brought down to the floor and then safety added to the electrical mains without being seen. The height adjustment factor was a necessary requirement for the client, as employees would be spending approximately 7-8 hours per day at each workstation. Allowing sit-stand routines to be controlled individually by the user, and with no restrictions on the number of height adjustments, a healthy working environment is achieved, and all at the touch of a button. Black powder-coated with a black Poivre Roc coloured laminate finish, the edit desks look sleek and beautiful, making any studio environment look like a world class working environment. See a demonstration of the new height adjustable edit desk at the MW Video stand M30 at B.V.E London from 28th February until 2nd March, and download the MW Video edit desk leaflet for more information.